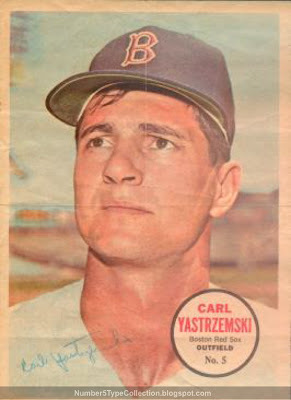 Though technically a mini-poster, great composition and lighting make this portrait my favorite Yaz card. It comes appropriately from his Triple Crown year, when Boston won their 1st AL pennant since 1946. Topps made annual poster-style inserts from the late 60s to the early 70s and 1967 is smallest at 5” x 7”, but its checklist includes an array of stars, from Aaron to Mantle to Yaz. Mid and late series 1967 wax packs included these posters at one per pack. Each came folded in quarters, so only proofs (and reprints) avoid vertical and horizontal creasing. Value: The 1967 Topps Baseball blog critiqued several inclusions in the poster checklist. I agree that Rose and Gibson would’ve made better choices than Knoop or Hunt, but lesser-known players also make the set easier and more affordable to complete. This wrinkled Yaz cost me $1 at an oddball show table. Fakes / reprints: O-Pee-Chee followed with a copy-cat version for Canadian release in 1968, but changed their numbering: OPC #5 is New York Met outfielder Cleon Jones.